Usha Initiatives believes that the spirit of a game lies in collective and all-inclusive participation, whatever the game may be. A belief that has led USHA Initiatives to take encourage and promote various sports initiatives at the most remote corners of the country. While travelling abroad immigration officers in Cricket playing countries are likely to ask you who is your favorite Cricket player? Whether it is a trick question to figure out if you really are an Indian or they just making pleasant conversation, is hard to figure out. Yes, we are a Cricket crazy nation, but we do play other games too and with each passing day good things are happening – Hockey and Football leagues, Golf, Boxing, Badminton, Lawn Tennis and other wrestling medals, to state just a few. A new sport that Usha through its sports initiatives is trying to popularizes since 2012 is Flying Discs or Frisbee, as it is more popularly known (for those who love facts Frisbee is the name of a company that manufactures these discs and not the actual name of the sport). Besides holding major tournaments in the country like the recent Bangalore Ultimate Open, USHA also conducts workshops both in urban and rural areas. 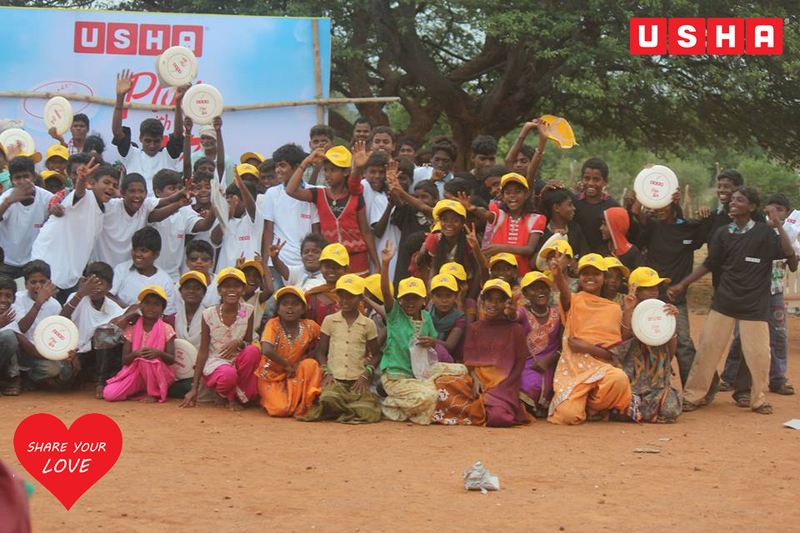 Holding firm to the belief of ‘Sports for all’ Usha conducted a community development and rural outreach Flying Discs workshop in a remote village near Coimbatore last year. In it 105 children from ten nearby villages were trained by experts during the two day workshop. Among them the experts found fast learners who perhaps if provided with the right opportunity would excel at the sport. Children who had the potential to make a difference both to themselves and the country, not just through Flying Discs but also in other sports – given their enthusiasm, willingness and determination. But what mattered during those few days was the joy of sharing, which brought smiles, giggles, jumps and flying leaps to children who otherwise live overburden lives between dilapidated schools and child labour. These shouts of joy were almost a call to action for USHA Initiatives, who now plan to hold more such workshops and camps in remote corners of the country and even taking the sport to others SAARC countries beginning with the mountain Kingdom of Bhutan. This entry was posted in Our Initiatives, Sports and tagged Flying Discs, Initiatives, Sports by Blogger. Bookmark the permalink.